Deliver Me: One of my Biggest Fans? My thoughts on this fan letter are in bold type. I actually visit your blog constantly and read all your posts which are very interesting. 10ion is one of our website and we usually work a lot to really make it much more informative for our viewers. But perhaps sometimes you don't work very much and it is less informative for your viewers? It's all about Home and Outdoor equipments like vacuum cleaner, electric gadgets etc. These types of details will be useful for those who look for the same info. We both of our very own sites are in same niche. Both of your sites, or are you saying that my blog which you follow and your blog are in the same niche? I don't blog about home and outdoor equipment very much. We recently offer a FREE complete infographics about "Essentials For Home and Outdoor". If you're interested I am pleased to share it to you to check over. While I wouldn't mind such a thing, I'm not sure I want to be ordering home and garden equipment from overseas. I'm in the United States. The person writing this email clearly is not. Please let us know your views about this mail. We'll be expecting your response. I asked them which of my blogs they follow. They haven't replied to me yet. This email smacks of Spam to me. 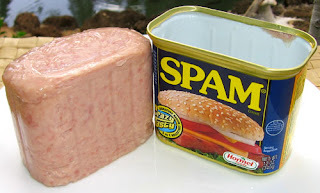 I find that if it looks like Spam, sounds like Spam, and acts like Spam, it's usually Spam.